"Amazulu" redirects here. For other uses, see Amazulu (disambiguation). The Zulu (/zuːluː/; Zulu: amaZulu) are a Bantu ethnic group of Southern Africa and the largest ethnic group in South Africa, with an estimated 10–12 million people living mainly in the province of KwaZulu-Natal. Small numbers also live in Zimbabwe, Zambia, Tanzania and Mozambique. The Zulu formed a powerful state in 1818 under the leader Shaka. 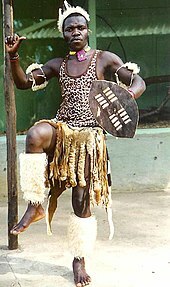 Shaka, as the Zulu King, gained a large amount of power over the tribe. As commander in the army of the powerful Mthethwa Empire, he became leader of his mentor Dingiswayo's paramouncy and united what was once a confederation of tribes into an imposing empire under Zulu hegemony. Zulu expansion was a major factor of the Mfecane ("Crushing") that depopulated large areas of southern Africa. In mid-December of 1878, envoys of the British crown delivered an ultimatum to 11 chiefs representing the then-current king of the Zulu empire, Cetshwayo. Under the British terms delivered to the Zulu, Cetshwayo would have been required to disband his army and accept British sovereignty. Cetshwayo refused, and war between the Zulus and African contingents of the British crown began on January 12th, 1879. Despite an early victory for the Zulus at the Battle of Isandlwana on the 22nd of January, the British fought back and won the Battle at Rorke's Drift, and definitively defeated the Zulu army by July at the Battle of Ulundi. After Cetshwayo's capture a month following his defeat, the British divided the Zulu Empire into 13 "kinglets". The sub-kingdoms fought amongst each other until 1883 when Cetshwayo was reinstated as king over Zululand. This still did not stop the fighting and the Zulu monarch was forced to flee his realm by Zibhebhu, one of the 13 kinglets, supported by Boer mercenaries. Cetshwayo died in February 1884, killed by Zibhebhu's regime, leaving his son, the 15-year-old Dinuzulu, to inherit the throne. In-fighting between the Zulu continued for years, until Zululand was absorbed fully into the British colony of Natal. Under apartheid, the homeland of KwaZulu (Kwa meaning place of) was created for Zulu people. In 1970, the Bantu Homeland Citizenship Act provided that all Zulus would become citizens of KwaZulu, losing their South African citizenship. KwaZulu consisted of a large number of disconnected pieces of land, in what is now KwaZulu-Natal. Hundreds of thousands of Zulu people living on privately owned "black spots" outside of KwaZulu were dispossessed and forcibly moved to bantustans – worse land previously reserved for whites contiguous to existing areas of KwaZulu. By 1993, approximately 5.2 million Zulu people lived in KwaZulu, and approximately 2 million lived in the rest of South Africa. The Chief Minister of KwaZulu, from its creation in 1970 (as Zululand) was Chief Mangosuthu Buthelezi. In 1994, KwaZulu was joined with the province of Natal, to form modern KwaZulu-Natal. Inkatha YeSizwe means "the crown of the nation". In 1975, Buthelezi revived the Inkatha YaKwaZulu, predecessor of the Inkatha Freedom Party. This organization was nominally a protest movement against apartheid, but held more conservative views than the ANC. For example, Inkatha was opposed to the armed struggle, and to sanctions against South Africa. Inkatha was initially on good terms with the ANC, but the two organizations came into increasing conflict beginning in 1976 in the aftermath of the Soweto Uprising. The modern Zulu population is fairly evenly distributed in both urban and rural areas. Although KwaZulu-Natal is still their heartland, large numbers have been attracted to the relative economic prosperity of Gauteng province. 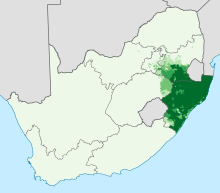 Indeed, Zulu is the most widely spoken home language in the province, followed by Sotho. 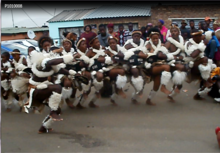 The language of the Zulu people is "isiZulu", a Bantu language; more specifically, part of the Nguni subgroup. Zulu is the most widely spoken language in South Africa, where it is an official language. More than half of the South African population are able to understand it, with over 9 million first-language and over 15 million second-language speakers. Many Zulu people also speak Xitsonga, Sesotho and others from among South Africa's 11 official languages. Zulus wear a variety of attire, both traditional for ceremonial or culturally celebratory occasions, and modern westernized clothing for everyday use. The women dress differently depending on whether they are single, engaged, or married. The men wore a leather belt with two strips of hide hanging down front and back. Most Zulu people state their beliefs to be Christian. Some of the most common churches to which they belong are African Initiated Churches, especially the Zion Christian Church, [Nazareth Baptist Church] and United African Apostolic Church, although membership of major European Churches, such as the Dutch Reformed, Anglican and Catholic Churches are also common. Nevertheless, many Zulus retain their traditional pre-Christian belief system of ancestor worship in parallel with their Christianity. Zulu religion includes belief in a creator God (uNkulunkulu) who is above interacting in day-to-day human life, although this belief appears to have originated from efforts by early Christian missionaries to frame the idea of the Christian God in Zulu terms. Traditionally, the more strongly held Zulu belief was in ancestor spirits (amaThongo or amaDlozi), who had the power to intervene in people's lives, for good or ill. This belief continues to be widespread among the modern Zulu population. Traditionally, the Zulu recognize several elements to be present in a human being: the physical body (inyama yomzimba or umzimba); the breath or life force (umoya womphefumulo or umoya); and the "shadow," prestige, or personality (isithunzi). Once the umoya leaves the body, the isithunzi may live on as an ancestral spirit (idlozi) only if certain conditions were met in life. Behaving with ubuntu, or showing respect and generosity towards others, enhances one's moral standing or prestige in the community, one's isithunzi. By contrast, acting in a negative way towards others can reduce the isithunzi, and it is possible for the isithunzi to fade away completely. In order to appeal to the spirit world, a diviner (sangoma) must invoke the ancestors through divination processes to determine the problem. Then, a herbalist (inyanga) prepares a mixture (muthi) to be consumed in order to influence the ancestors. As such, diviners and herbalists play an important part in the daily lives of the Zulu people. However, a distinction is made between white muthi (umuthi omhlope), which has positive effects, such as healing or the prevention or reversal of misfortune, and black muthi (umuthi omnyama), which can bring illness or death to others, or ill-gotten wealth to the user. Users of black muthi are considered witches, and shunned by the society. ^ a b c d e f g h "The Zulu people group are reported in 7 countries". Retrieved 29 November 2016. ^ International Marketing Council of South Africa (9 July 2003). "South Africa grows to 44.8 million". www.southafrica.info. Archived from the original on 22 May 2005. Retrieved 4 March 2005. ^ "izulu in English | isiZulu to English Translation - Oxford Dictionaries". Oxford Global Languages. Retrieved 2017-01-26. ^ Bulliet (2008). The Earth and Its Peoples. USA: Houghton Mifflin Company. p. 708. ISBN 978-0-618-77148-6. ^ "Ethnologue report for language code ZUL". 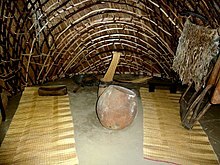 www.ethnologue.com. ^ Irving Hexham (1979). "Lord of the Sky-King of the Earth: Zulu traditional religion and belief in the sky god". [Studies in Religion]. University of Waterloo. Retrieved 26 October 2008. ^ Henry Callaway (1870). "Part I:uNkulunkulu". The Religious System of the Amazulu. Springvale. ^ a b Adam Ashforth (2005). "Muthi, Medicine and Witchcraft: Regulating 'African Science' in Post-Apartheid South Africa?". 31:2. ^ Molefi K. Asante, Ama Mazama (2009). Encyclopedia of African religion, Volume 1. Sage. ^ Axel-Ivar Berglund (1976). Zulu thought-patterns and symbolism. C. Hurst & Co. Publishers. ^ Abraham Modisa Mkhondo Mzondi (2009). Two Souls Leadership: Dynamic Interplay of Ubuntu, Western and New Testament Leadership Values (PDF) (Thesis). submitted in fulfillment of the requirements of the degree of Doctorate in Theology, University of Johannesburg. ^ Nwamilorho Joseph Tshawane (2009). The Rainbow Nation: A Critical Analysis of the Notions of Community in the Thinking of Desmond Tutu (PDF) (Thesis). submitted in fulfillment of the requirements of the degree of Doctorate in Theology, University of South Africa. ^ "Art & Life in Africa Online - Zulu". University of Iowa. Archived from the original on 31 May 2007. Retrieved 6 June 2007.